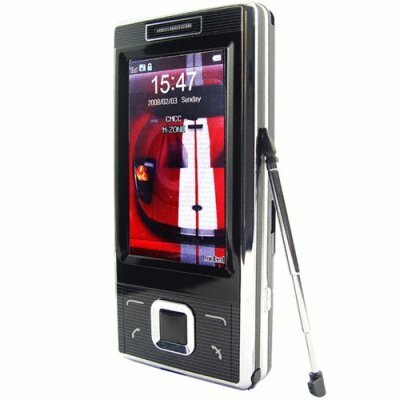 Successfully Added Slider Cell Phone - Slim Touchscreen Media Mobile Phone to your Shopping Cart. Slim slider cell phone with crystal clear display. This easy to use touchscreen cellphone is a great little phone for any active business person on a budget. The CVSCN-8300 mobilephone includes Bluetooth, WAP, TV, and wonderful software tools including a "thrifty" energy saving mode for maximizing up-time between recharges as well as multiple security tools. If you want to showcase any easy to use touchscreen cell phones in your online store, then we encourage you to choose this model because your customers will just love the features and price of this baby. Order your stock today and we will ship it out via your favorite express carrier tomorrow. Slim slider style touchscreen mobile phone. Easy to use phone with business friendly security and software features. celular mt bom mesmo, eu recomendo!